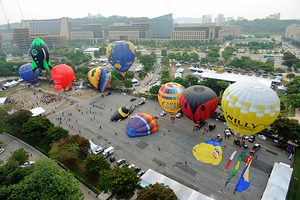 After eight consecutive years of hosting the event in Putrajaya, MyBalloonFiesta has finally found itself closer to the heart of Malaysia, Kuala Lumpur! Nestling itself in the scenic neighbourhood of Desa ParkCity, the 9th MyBalloonFiesta is back with its aptly themed “Balloon in the Park”. Eighteen balloons from eleven countries comprising of special shapes and colourful designs are expected to be in town this year, as the hot heat rises from 4pm - 10pm, March 10th - 12th 2017. The Fiesta is expected to see a diverse crowd of local and also foreign tourists attending this annual event. Morning sessions are dedicated exclusively for MyBalloonClub members with live jazz performance, gourmet buffet breakfast and complimentary balloon tethered ride. General Admission for the public will only be in the evening session where there will be a Hot Air Balloon Display and Night Glow Show from Friday - Sunday.